Dave Lovalvo worked in the ocean exploration field for thirty years, and has spent twenty eight years exploring Yellowstone Lake. As one of the founders of the Global Foundation for Ocean Exploration he works with the Office of Ocean Exploration and Research to promote ocean exploration and underwater research. Along with his team Lovalvo is currently running a Kickstarter campaign for Yogi, an exploration robot designed to study Yellowstone Lake. Yellowstone is the first national park and there are several studies that have talked about the park’s above ground ecosystem but the lake and underwater resources remain unexplored. The team hopes to find crustaceans and sponges that might feed off the Earth’s heat and chemistry. Thermophilic microbes might be able to give insight into new medical and biological advances, and Thermus aquaticus was discovered in the park in 1966 and helped to change the way we copy DNA. The team estimates that only one percent of the lake’s microbes are currently discovered. A team of engineers has designed Yogi as the next generation of underwater exploration robot. 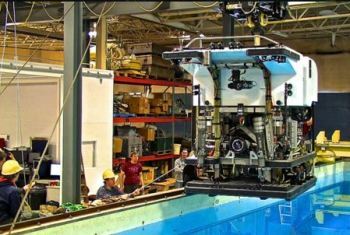 An HD camera, robotic arm, thrusters, buoyancy packs, navigation equipment, pressure sensors and a system for tethering are all being developed and designed for the new robot, with a price tag of approximately $200,000. A private donor has offered to match public donations to the project so the campaign is looking for $100,000 in funding. The craft itself will by 3 x 3 x 4.5 feet, weigh around 600 pounds with space to carry 120 pounds of payload, and be able to dive down to 1500 meters below the surface. The team expects that when fully operation Yogi will have a lifespan between ten and twenty years. Two vertical thrusters work with four axial thrusters to propel the robot through the water, and a five axis arm allows for precise sample collection. A 130 color sonar system and acoustic navigation system are planned with the possibility to add new sensors and cameras as technology advances. This is a great project designed to push the boundaries of our current understanding of underwater life. The team building a robot designed to last twenty years is amazing and will be fascinating to watch over the next decade. 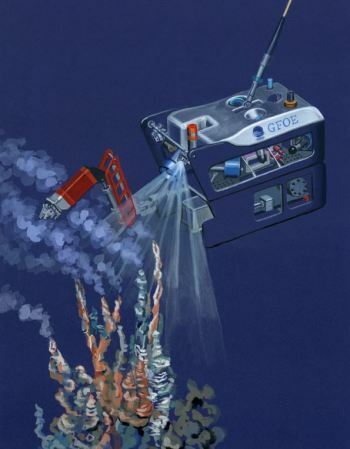 The Global Foundation for Ocean Exploration is involved in several other projects involving underwater exploration and research. An interesting aspect of this Kickstarter campaign is that contributions are tax deductible because the Foundation is 501c(3) non-profit organization. The campaign ends on May 3, 2016.